Myanmar is an incredibly diverse country, home to over 100 hundred different ethnic groups. Each unique stop on this 11-day expedition will feel like a world unto itself. We'll photograph on land, on water, and by air; we'll see sunrises and sunsets; we'll explore shadowy caves by day and striking stupas by night. John McDermott, a professional photographer who has worked throughout Myanmar and neighboring regions, will provide the group with hands-on guidance and expertise. Throughout the journey, our cameras will act as a constant reminder to pause and observe, to pay attention to details and ask questions about the rituals, traditions, and cuisines that we'll experience together. We'll begin in the city of Mandalay, Myanmar's former royal capital, stretching along the Irrawaddy River. 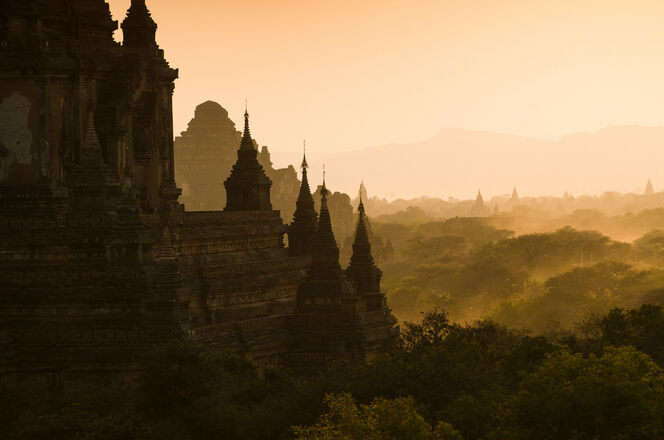 From there, we'll take to the waterways, bound for the ancient capital of Bagan, a vast flood plain dotted with hundreds of temples and stupas stretching into the horizon. 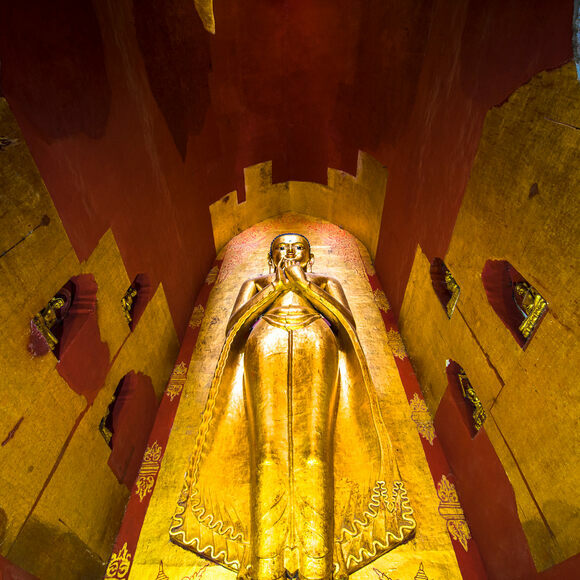 Next, it’s on to Pindaya to explore limestone caves home to thousands of shining Buddhas, and then to Inle Lake, a pristine body of water featuring floating gardens, markets, monasteries, and traditional fishing boats. 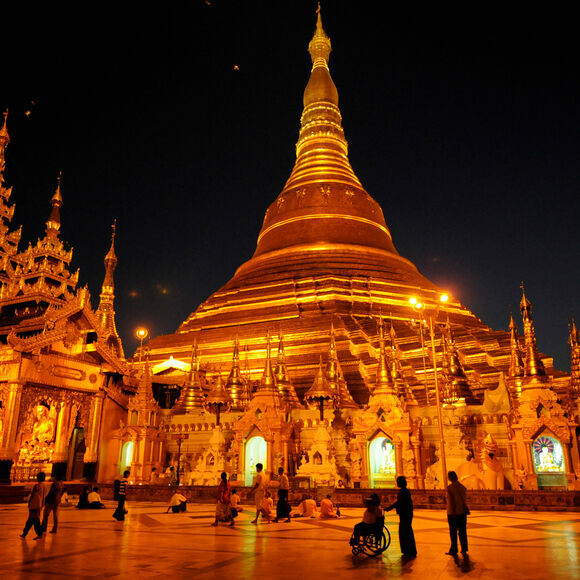 Our final days together will bring us to Yangon and the Shwedagon Pagoda, the country’s largest and most important religious shrine. Fly into Mandalay, where your guide will be ready to meet you when you land. You'll then transfer by car downtown (one-hour drive) to the hotel, where you can take some time to rest and settle in. In the early evening, we'll meet in the hotel and set out for a walk through parts of the Old Quarter and along the Palace Wall, before a welcome dinner at a local restaurant where we'll get a preview of our time ahead. 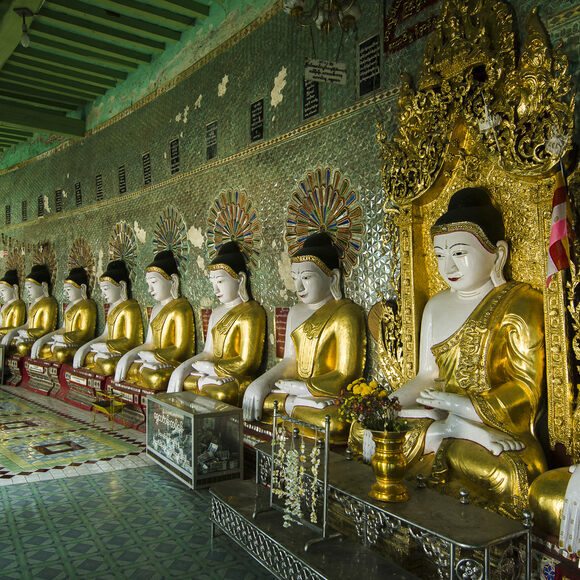 Today, we'll ease into the morning with a visit to Mandalay's Mahamuni Pagoda and the Marble Carving Street, with plenty of opportunity to stop and photograph. After lunch at a local restaurant, we'll embark on a city tour that highlights the Shwenandaw and Kuthodaw Pagodas as well as several lesser-known hidden wonders. Following dinner, head back for an early night's rest, or stay out for your own evening explorations. This morning, we'll grab an early breakfast and set out to photograph the dramatic U Bein Bridge at sunrise. Continuing onwards, we'll visit Sagaing’s Kaungmudaw Pagoda Festival. This is one of the most colorful pagoda festivals in Myanmar, during which families celebrate in brightly colored traditional Bamar costumes, traveling together in covered bullock carts. Later, we'll climb aboard our riverboat and cruise downstream on the Irrawaddy River to Yandabo (four hours) with lunch served on board. It will be a busy morning full of dazzling photo opportunities, and our afternoon on the riverboat will be a perfect time to sit back and relax. In the evening, take some time to explore Yandabo Village before we settle into Yandabo Home. We'll be treated to a comfortable and uniquely Burmese experience with a delicious dinner of traditional curries. We'll start the morning with a traditional breakfast, before photographing Yandabo’s famous pottery works. We'll continue to Bagan by boat (3 hours). On arrival, we'll transfer to the Thande Hotel. Our guides will take us for a late-afternoon walk in the Bagan Archaeological Zone, where we'll stroll past massive temples and fields of sesame tilled by oxen. We'll enjoy dinner at a local restaurant before returning to the hotel for the night. Today is a highlight of our trip, with the opportunity to take a sunrise hot air balloon flight over the heart of the Bagan Archaeological Zone. (Optional inclusion for an additional $300.) Thiha will teach us all about the mythology of the Bagan era and its Buddhist principles, while John will provide expert guidance on how best to photograph the dramatic temple exteriors at both dawn and dusk, as well as their more shadowy interiors. In the afternoon, you're free to explore the archaeological zone at your own pace, with maps made available to help you with your bearings. We'll gather back together for dinner and another night in Bagan. This morning after breakfast, we'll hop on a regional flight from Bagan to Heho, a small town in the Southern Shan State. When you step off the plane, you'll notice the air here is noticeably cooler, compared to the Irrawaddy floodplain. From the airport, we'll drive through rolling hills filled with potato and wheat fields to the quaint market town of Pindaya, home to the Pwehla Traditional Market, which we'll have some time to wander around. 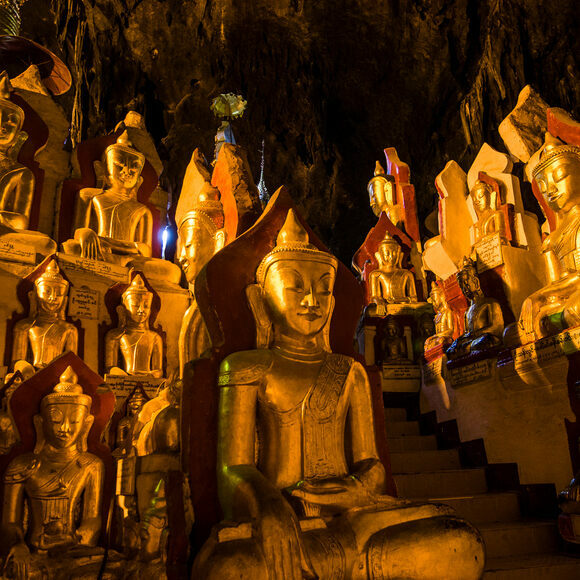 After a relaxed lunch, we'll make an afternoon visit to Pindaya’s famous limestone caves, filled with thousands of Buddha statues collected there over several centuries. From there we'll have dinner, and spend the night at the Inle Inn Pindaya. This morning we'll visit the bustling Pindaya Market and photograph a traditional monk’s procession. From there, we'll drive to Nyaungshwe, a township located on the shore of Inle Lake, where we'll enjoy an early lunch at a local restaurant. (Driving time is about 3 hours, with several photography stops.) We'll then board a boat and float across Inle Lake to the lovely Ann Heritage House, our hotel for the next three nights. 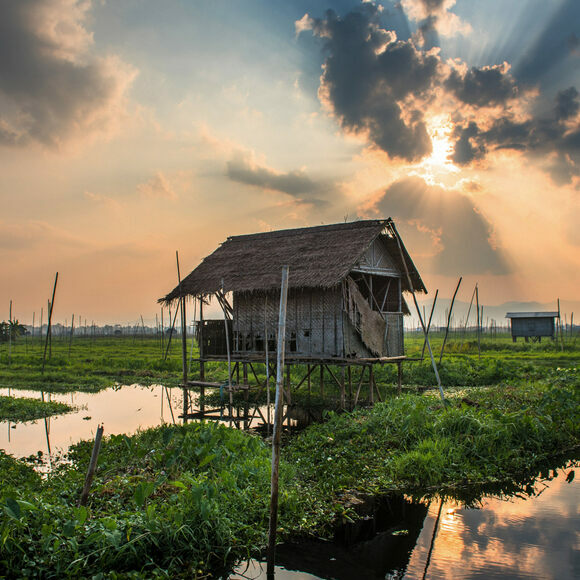 After some time to rest and relax at the hotel, we'll enjoy a late afternoon boat ride, meandering through traditional floating gardens, and then walking through market gardens, rice paddies, and Intha Villages until sunset. We'll return to the hotel for dinner and a tranquil night's rest. 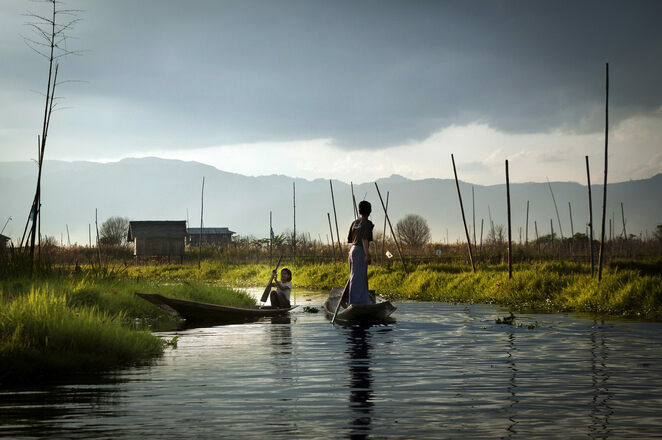 After waking up right along the water's edge, we're lucky enough to enjoy a full day at Inle Lake. We'll have the chance to visit a lake-bound monastery and photograph floating gardens and traditional villages set high on stilts above the water. Along the way, we'll have lunch at the Green Chilly Restaurant in Nampan Village, and return for dinner back at Ann Heritage House. 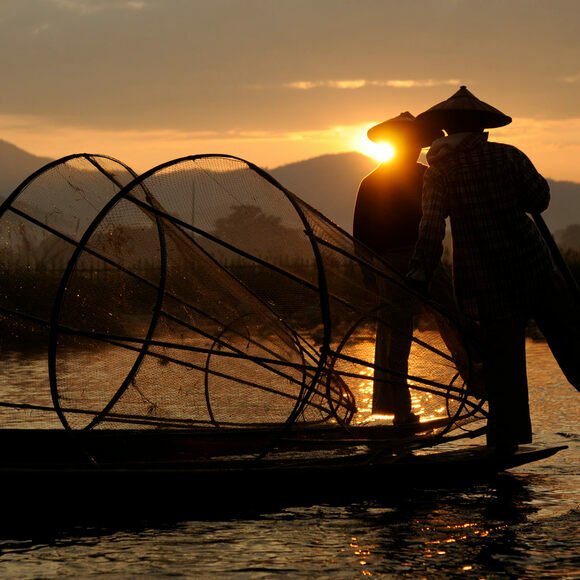 Setting out early in the morning, we'll navigate narrow waterways, heading south from Inle Lake toward the deeply traditional markets of Kyauk Thein. We'll return by way of a gorgeous Intha monastery, where we'll have tea with monks and time to explore the adjacent village. Lunch will be at a local restaurant before returning to the hotel in the early afternoon. This is our last afternoon at the lake; feel free to rest and relax, or continue to explore the nearby village, farms, and rice paddies before gathering for dinner and our last lakeside overnight. This morning, we'll transfer by boat and by vehicle from Inle Lake to Heho Airport for a one-hour flight to Yangon. Upon arrival, we'll be driven downtown to the Summit Park View Hotel, located just around the corner from the towering Shwedagon Pagoda. In the afternoon, we'll take a walk in the area, strolling down Pansodan Street past the colonial High Court to Sule Pagoda and the city’s famous Scott Market. For our last sunset together, we'll soak up the atmosphere and evening glow surrounding Shwedagon Pagoda, before a final farewell dinner. Today, catch flights home from Yangon or onto your next destination—or, if you'd like, spend a few more days exploring the area. Our guides will be happy to provide additional recommendations. Until the next adventure! Note that the trip begins in Mandalay and ends in Yangon. When planning your travel, we recommend flying into Mandalay International Airport (MDL) by 3 p.m. on November 8 and departing from Yangon International Airport (RGN) anytime on November 18. Thailand's Bangkok International Airport (BKK) is a convenient hub for connecting flights. We are happy to refer you to our flight specialists for assistance in booking your travel. You should feel comfortable walking four to five miles over the course of each day and remaining on your feet for long periods of time. The trip includes transport by foot, boat, and private van, in addition to two regional flights. Participants should have a strong basic understanding of the digital photographic process, including some post-processing skills using Adobe Lightroom and/or Photoshop, or their equivalent. A good DSLR or high-end mirrorless camera is suggested along with the proper user manual and/or complete understanding of the camera’s menus. Each participant should have a good kit, but one that is compact and easy to carry on your person at all times. Lens selection is a user choice but situations will call for both wide-angle and telephoto capabilities, and fast lenses are preferred. Tripods are optional but recommended as they will come in handy in low light and dusk settings. Email us if you'd like our full set of suggestions for your photo gear kit. Remember that it is always important to ask permission to photograph someone, even if it is just with a nod of the head, and especially from anywhere close-up. The total cost of this trip is $4,980. A $500 deposit is required to hold your space. The deposit is non-refundable after three days. The final payment of $4,480 will be due by August 5, 2019. All reservations will be final after this date and subject to our cancellation policy. By submitting your deposit, you agree to the trip's Terms & Conditions. For travelers wishing to have single accommodations during the trip, an additional $495 will be due at the time of the final payment. Ten nights of accommodations in boutique hotels. All meals during the trip, beginning with dinner on November 8 and ending with dinner on November 18. Transport throughout the trip in private, air-conditioned vehicles and boats. Internal flights from Bagan to Heho (Day 6) and Heho to Yangon (Day 10). Entrance fees for all included visits and activities. Gratuities to hotel staff and drivers. The company of a talented photography instructor and experienced local guide. International flights to/from Myanmar: Note that the trip begins in Mandalay and ends in Yangon. 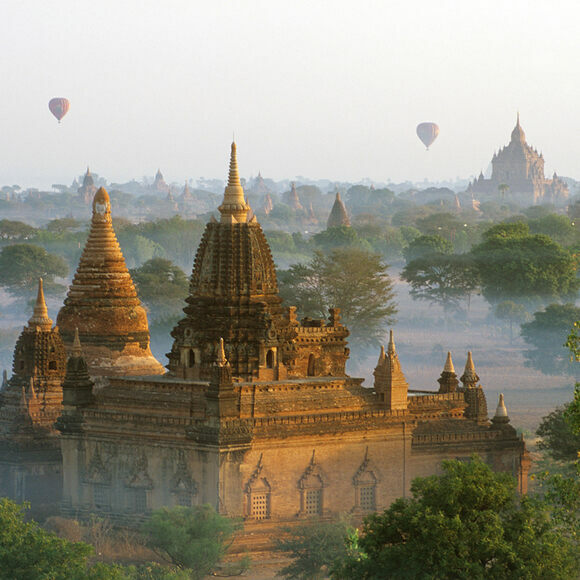 Optional hot air balloon flight in Bagan ($300 per person). November is the start of Myanmar's more temperate winter season, with daytime temperatures in the upper 80s to low 90s°F (32–34°C), dropping down to the low 70s°F at night (22°C). Keep in mind that we’ll be spending lots of time outdoors and moving around. Why are you offering a trip to Myanmar? Aren't you supporting a bad military government? Myanmar has many things to recommend it as a travel destination, but there's no question that it's more complex than it's usually portrayed to travelers. To gain a more nuanced understanding of Myanmar is, in our view, one of the reasons to go there—specifically with guides and fellow travelers who are interested in much more than just sightseeing. 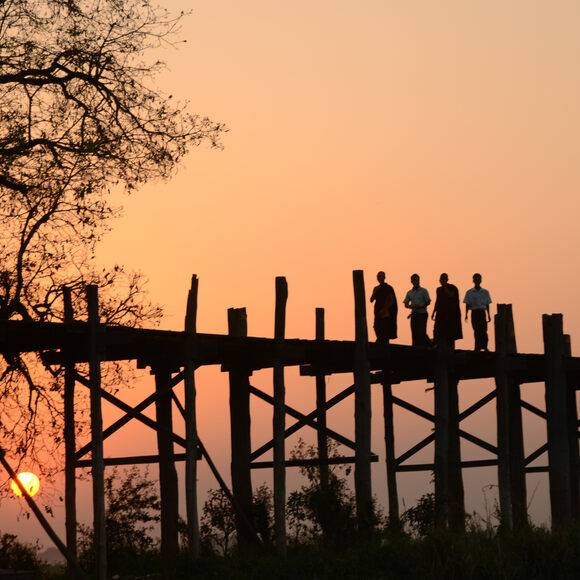 Our local guides are committed to showing you what makes these places so special to the people who call them home, and operating in an ethical way and with a high level of respect for all Burmese people. Like everyone, we are appalled by the ongoing persecution of the Rohingya Muslims. 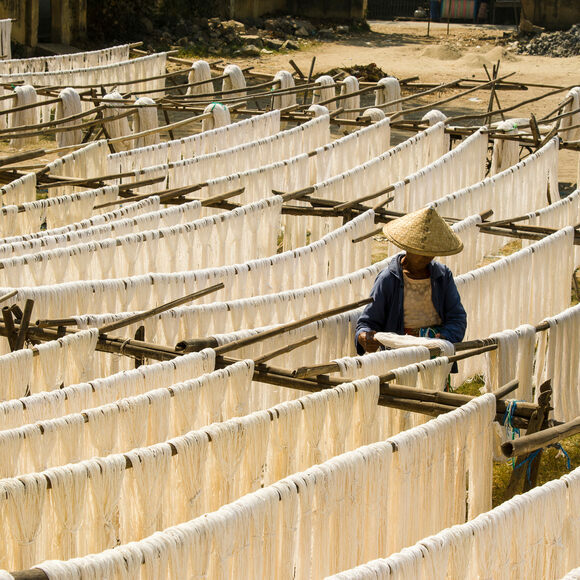 At the same time, it’s clear that tourism in Myanmar can still be a force for good, especially when we’re able to work directly with local vendors and communities. To the best of our knowledge, in operating this trip, we do not work with any suppliers who are connected to the military elite. A portion of everything we earn goes toward efforts to reform the country’s education system through the Parami Foundation. In addition, the money that we spend in villages throughout the trip lifts people’s lives, and in a small way, helps empower people who are not a part of the country’s established power structures.